The pace is slow but the morning is fine. We weave around fallen trees, climb up muddy roots, sift through tall grass and crown fern to catch the occasional glimpse of clear blue sky and towering granite face. 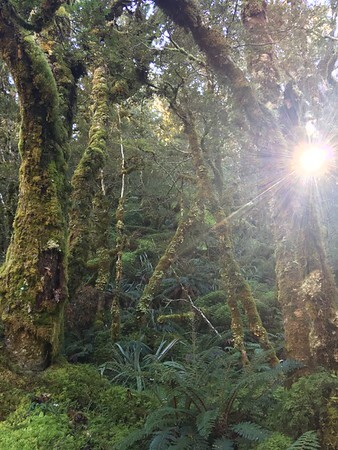 As this is one of Fiordland’s many hanging valleys, after the steep ascent beside waterfalls and boulders we reach level forest with sun breaking through the trees. We choose an exit point from the marked route and climb up, up, and up through mossy beech trees. Their old-growth size catches my attention as each stately silver beech appears larger and more gnarled than the last. 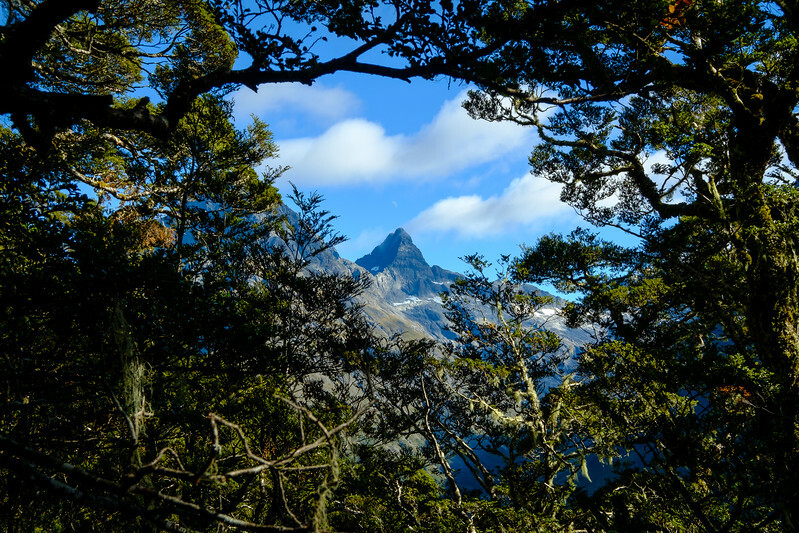 My favorite tree through which I can glimpse Fiordland’s sheer summits: this is a personal heaven. Finally, the trees tighten, the slope steepens, and scrubby dracophyllums infiltrate the undergrowth to make our travel difficult. I crawl under, swing around, and squeeze through narrow gaps in the vegetation to propel myself forward. I find my size an advantage in this sort of country and pull ahead to reach that highly anticipated place where the trees stop and the tussock and shrubs begin. 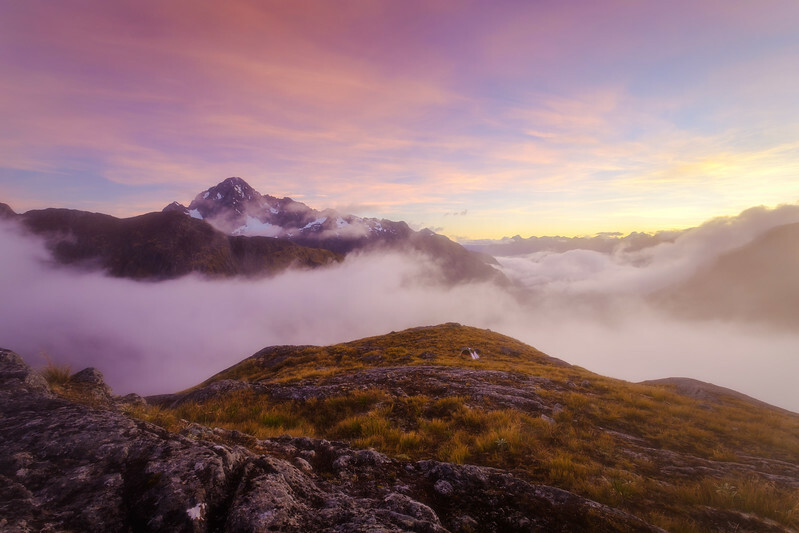 The sweeping views of Fiordland hit me with force as a long-awaited dream. 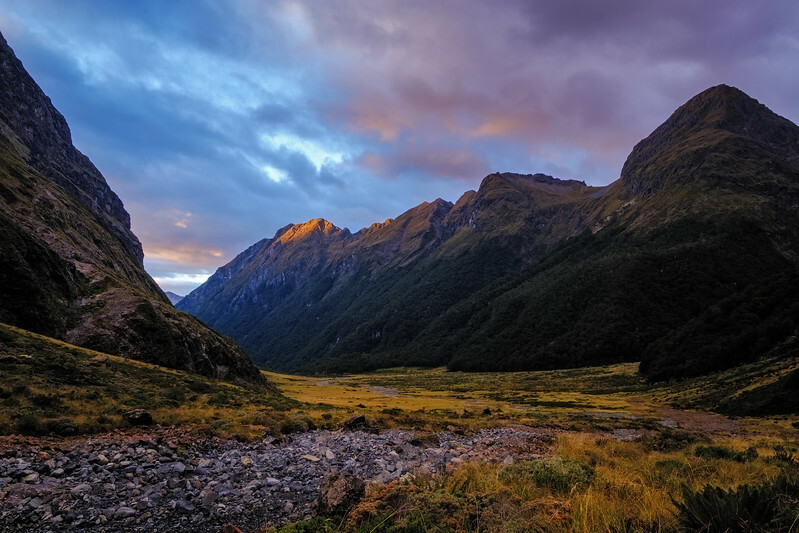 This is my first multi-night tramping trip in what I consider to be my favorite national park in the world so everything I see has a special magic. 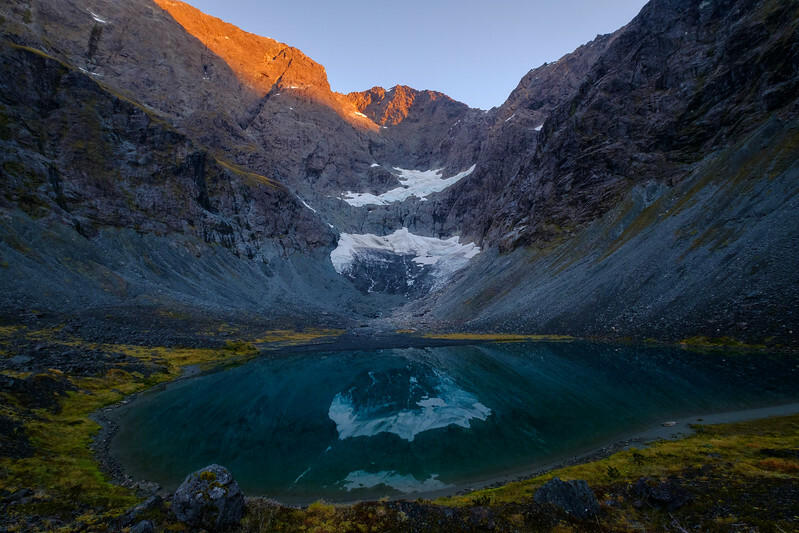 Falls Creek below me in a deep U-shaped valley walled by vertical granite and shadowed from the sun even at midday – its branching stream and wetland pools glimmer with reflection, the Darran Mountains straight ahead capped by the glacial-hung Mount Christina, and the golden snowgrass slopes to my left – beckoning me toward Consolation Peak and Ngatimamoe. On toward those not-so-distant peaks we aim – sidling across tall, golden snowgrass in and out of gulleys that funnel water from the high country to the valley below in times of rain – feeding the waterfalls that give this place its name. Flat ground is reached for an instant beneath high points giving access to a new water catchment below – Melita Stream. 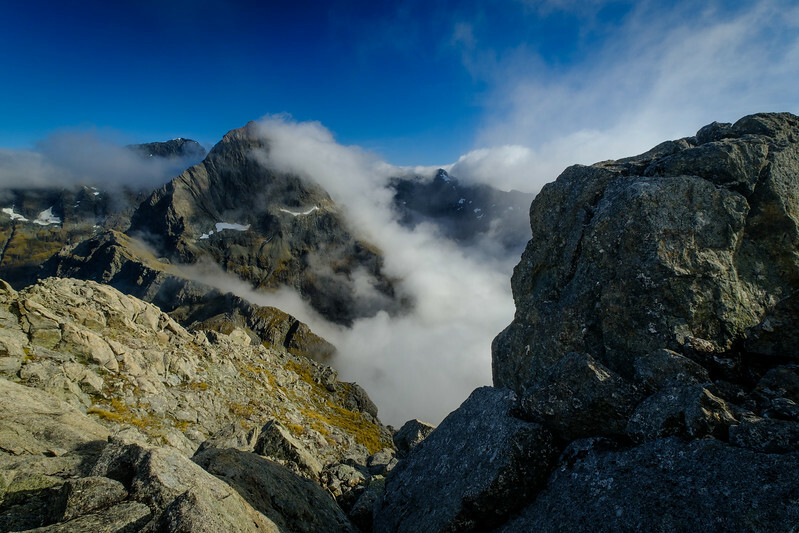 We spy the terraces of Consolation Peak above and climb steep slopes until we reach them. Flat ground? Check. Clear water in rocky pools? Check. Extraordinary views in all directions? Check. It looks like this is camp for the night. The breeze is cold but my sleeping bag provides shelter. 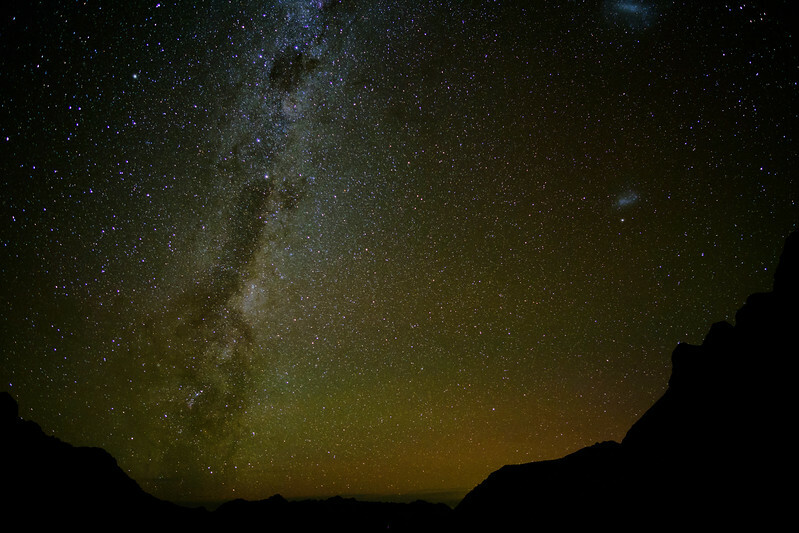 I wrap myself in it at every opportunity – dinner, stargazing, and even photographing when I can pull it off. 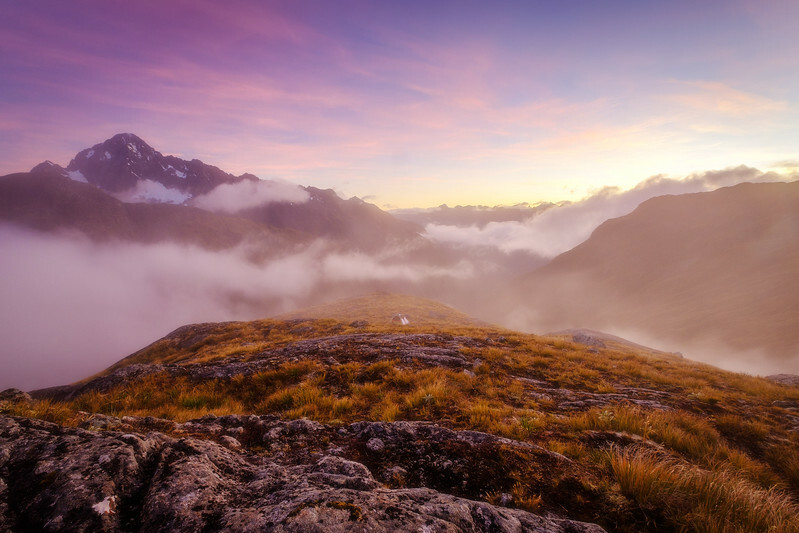 I fall asleep wondering whether we could go further the next day, whether we’ll end up here or there, until I realize that goals and end points aren’t the reason I’m in Fiordland at all. I decide that I’m okay with the now and aim to focus my attention on presence in the moment – whatever it might be. Morning arrives and I must pull myself up and out to see this beautiful place arrayed in its most delicate light. I soon find that it’s worth it as mist rolls and cloud inversions fill the valleys. Suddenly all is pink and glorious – I press the shutter over and over just to be sure I captured this moment. The grey terraces and blue pools on Consolation’s flanks light up in orange and pink as dawn becomes more powerful. 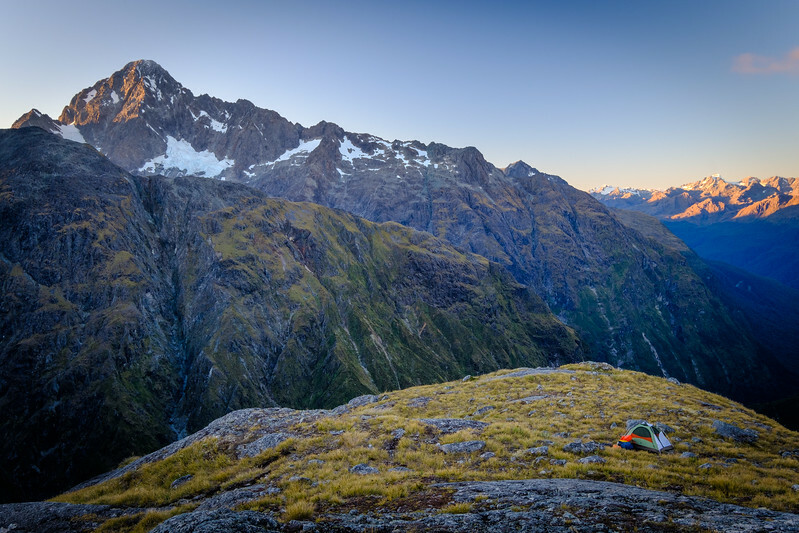 We pack away any sign of our camp under the curious supervision of a kea and set off on a steep sidle between the summit and the plunging valley below. 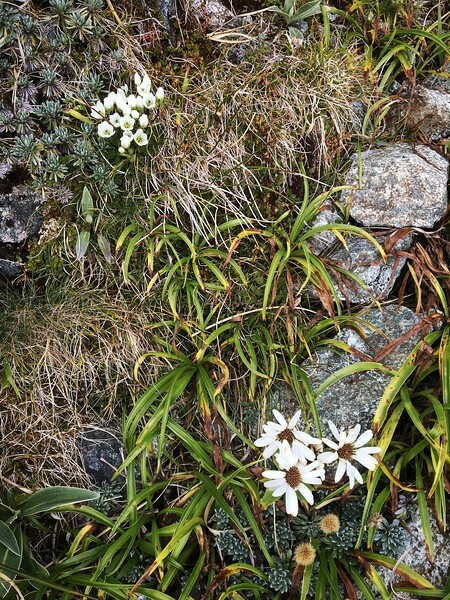 I pick my way carefully over the precarious ground and notice late season wildflowers next to my boots and hands – pure white gentians and snow marguerites along with many species of mountain daisy. As I climb, I think of how these intimate details alongside grand attention-grabbing scenery give my heart much joy. 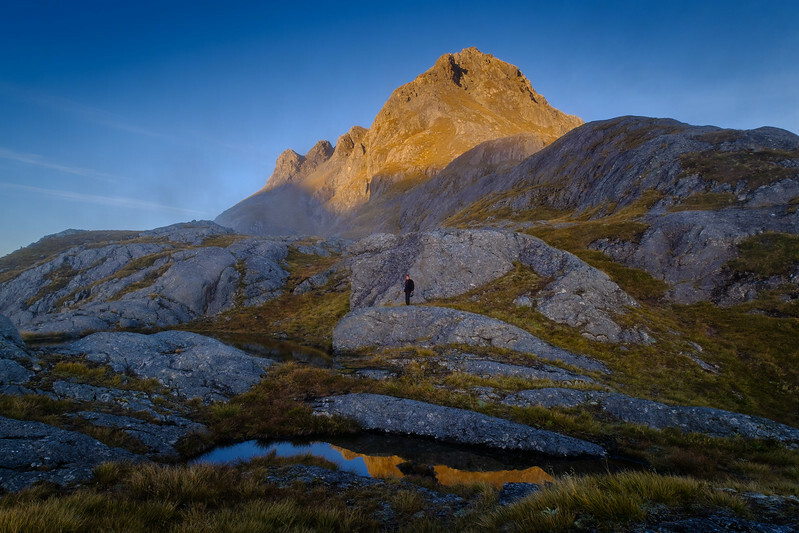 We scramble up to the blocky ridge leading down from Consolation and leave our packs next to the home of another dweller of the alpine realm – the rock wren (piwauwau). Each time we hear its high-pitched call we stop to seek its green flash among the rocks. A gorgeous yet tiny high-browed bird with a crown of white above the eye is a treat to see in the mountains. Our packs behind us, we climb unencumbered up the rock steps and scree to the summit of Consolation Peak. 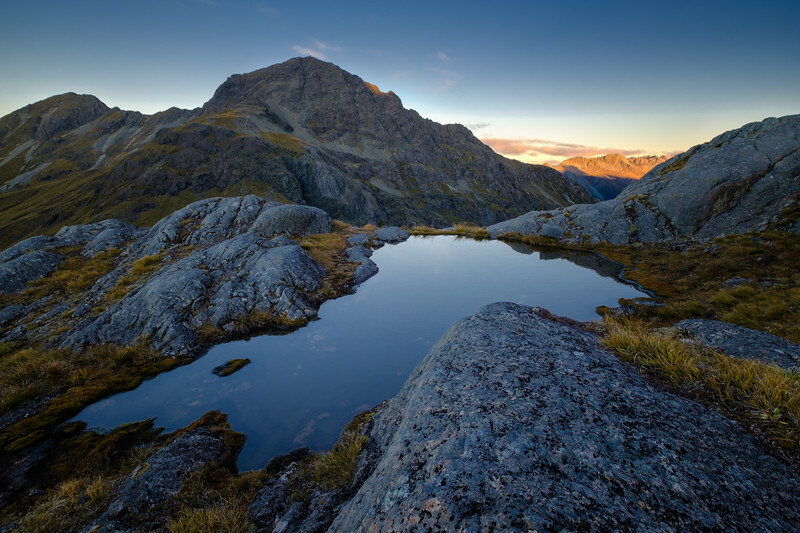 We find a tumbled mass of giant boulders and epic views of sharp Ngatimamoe before us. We soak in the view and victory of the summit for as long as we can. I feel unhurried and intensely engaged in my surroundings. U-Pass – tomorrow’s path – stands out in the sun along the otherwise impenetrable wall of mountains beyond. I think of how passes such as this provide the only link for those who travel by foot between watersheds. 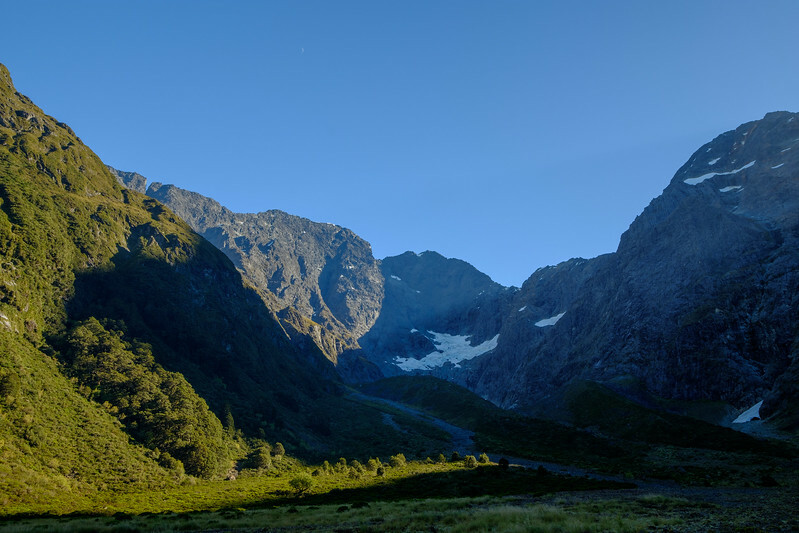 In Fiordland, there are so few places that aren’t sheer, where a person can tread with ease. A land envisioned for creatures of flight, I always imagine. We reach our packs, hoist them, and continue down to the pass that will allow us access into Mistake Creek. 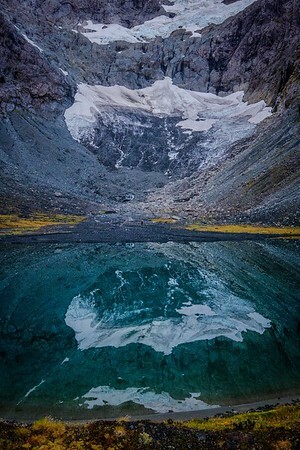 We enter the valley perfectly etched by glaciers that hangs above the lower Mistake and follow its trickling flow as it gurgles above and below rocky ground to a steep-sided forest where the two meet. We slip and slide (and in my case fall) through this dense forest until we reach the valley floor. I shake beech leaves from my hair and clothes and walk up-valley to the impressive 1000 meter cliffs that form its head. Our group comes together to find a campsite on the flats sheltered by moraine just behind the lake that feeds the namesake creek. I find the setting reverent, awe-inspiring, grandiose, and also a touch stark as the last light of day slips through a notch in the high cliffs. We are far removed from the sun here and we soon slip into shadow. 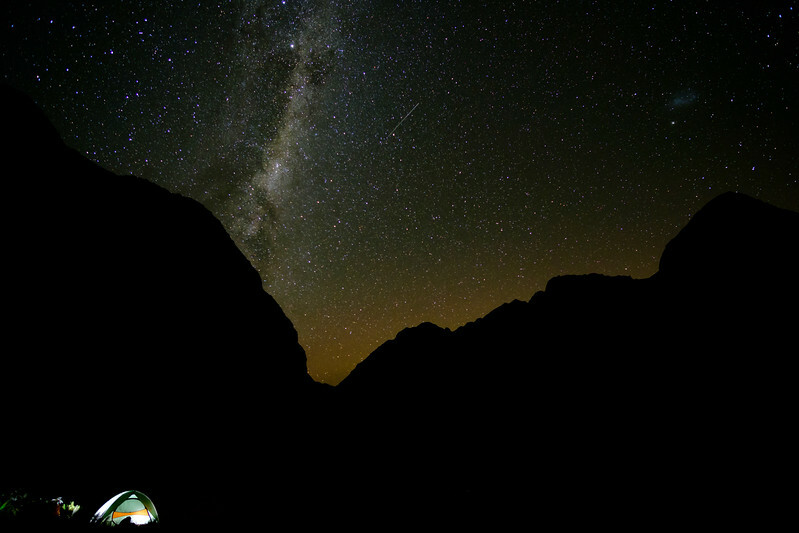 Stars soon brighten the scene and we watch a long while as the Milky Way builds in intensity overhead. A whio calls in the darkness – a noise I’ve come to know as an integral part of the soundscape of New Zealand wilderness. I find relief in the darkness of autumn that allows ample time to observe this most fundamental yet magnificent reward of the mountains – a clear night sky. It is so easy to move quickly and miss the beautiful practice of contemplating the stars. It is a time and place like this that reminds me of what’s out there. Dawn: calling paradise shelducks, crackling ice from glaciers above, still turquoise water, and vibrant red-orange glow on the high peaks. This place barely fits into my 10-mm field of view. On first glance it’s the scale that gets me but on closer inspection it’s the details of ice and rock, herb and snowberry that fascinate. The morning unfolds with probing of potential routes over the steep snowgrass and bluffs to the next basin over that leads to U-Pass. 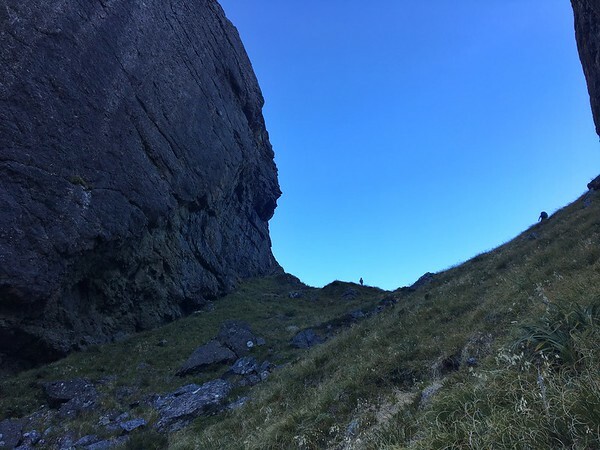 Can we find a gap in the precipitous slopes to follow on foot to where we need to be? After much trial and error, discussion, and scratching of heads we decide as a group to abandon the high slopes for the traditional waterfall route down-valley. Perhaps with more time we could find a narrow crack to climb but today we’d rather be sure we can reach the pass. I soon find joy in our decision as the forest we now must ascend is possibly the most beautiful I’ve ever seen. Every type of lichen imaginable clings to silver beech and sphagnum moss envelopes the ground. I can’t be hurried as I stop to gaze at little flowers, the way the morning sun filters through the trees, and cascading waterfalls rushing white foamy water over deep green rocks. This is divine. My heart grows bigger with love for both the open mountains and forests like these. It’s not long until we find ourselves above the trees again sidling through fern, grass, and shrub. A human voice is heard and to my surprise I see two figures making their way toward us. I always find it startling to discover others in a place like this after days alone or with my own party. Happily, we soon find ourselves in good company with a like-minded adventurous mother and daughter duo and move together as a group toward the waterfall below the pass. We carefully climb the exposed sections between bluffs by pulling ourselves up with strong alpine vegetation. We reach the top of the waterfall and I quite literally dive between rocks to reach the subterranean water flow for a drink and refill for the group. Lunch is enjoyed on boulders in the sun in a fine alpine basin. This is an autumn day to remember. U-Pass is a totally unique and phenomenal chunk taken out of an otherwise unbroken wall of extremely steep rock. I gape with eyes drawn upwards at this space in the rock as I climb to reach it. Each person chooses his or her own path and we spread out across the sunny slope. Yet, when we reach the pass, the narrowness forces us together between vertical rock faces that stand like bookends. I look back and forth between where we’ve come from and where we’re going. To reach Hut Creek there’s no other route but down the other side of the pass and so we continue – picking our way over rocks and stream until we reach the valley floor once again. It’s up from one valley and into the next on this journey. We struggle to make camp amidst the constantly sloping ground but finally find a little patch near the river’s edge. It’s been a long day and a hot meal can’t come soon enough. These little details take so long but are so rewarding when accomplished. 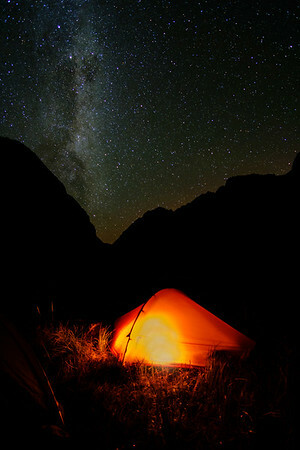 Finally, we settle in and talk under yet another clear starry sky. We fall asleep wondering whether morning will bring rain our way. The morning is warm with cloud cover and a small touch of golden sun dances on the mountains down-valley. I photograph this scene while enjoying an extra portion of oatmeal in celebration of our decision to walk out today via Hut Creek and to ring in a friend’s birthday – backcountry style. The longer version of our itinerary can wait for another time. Today it feels right to walk out as the mist gathers and Glade Pass becomes hidden in storm. The trees grow taller as we follow the riverbed down. Soon I notice ribbonwood and kotukutuku in their autumn dress and towering red beech on the valley floor. A fantail (piwakawaka) follows us for hours through the trees and only departs when we cross the Eglinton on a walk-wire. Hand over hand, step over careful step on the wire brings us to the other side and shortly the Milford Road. How strange it is to be back yet again in this busy place that no longer feels normal. 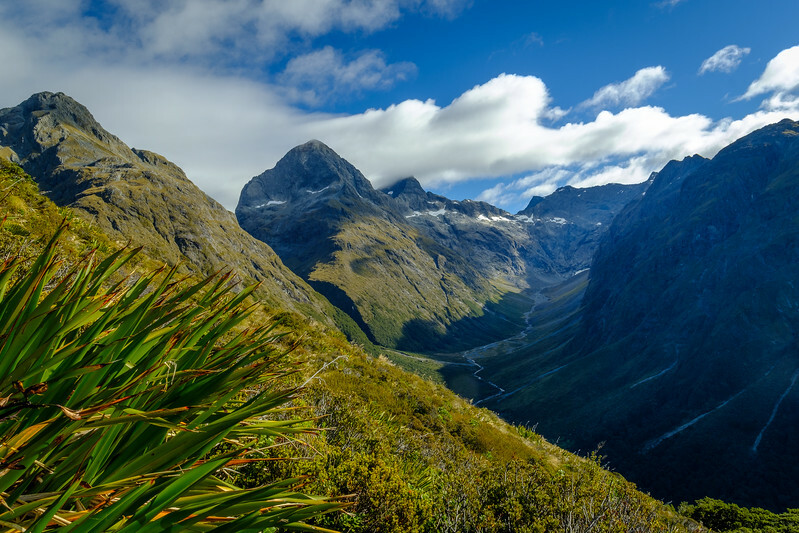 However far I might travel from these mountains, forests, and water for now, I know it won’t last and that I’ll soon return to seeing more of what lies around bends and over passes in hidden Fiordland, Ata Whenua.